There are tons of free things to do in New York all day, every day! Tours, attractions, museums, events, shows, sports, movies and more. Kids, adults, outdoors, indoors, active, lazy…you name it! So whether you want free Museums, neighborhood tours, a moonlight bike ride in Central Park, to ride the Staten Island Ferry, walk the High Line or Brooklyn Bridge, we have you covered with 100s of free things to do in NYC. New York Public Library – Free one-hour tours of the Stephen A. Schwarzman Building (42nd St & 5th Ave) 11am & 2pm, Monday – Saturday. Federal Reserve of Bank of NY Museum and Gold Tour – Mon-Fri, 1pm & 2pm. Very difficult to get reservations, but worth a try! Grand Central Terminal – free 1.5 – 2 hour walking tour, 12:30 pm in the sculpture court at 120 Park Avenue, located at the southwest corner of East 42nd Street and Park Avenue directly across from Grand Central Terminal. Central Park Moonlight Bike Ride – 10pm, first friday of every month. MoMA – A Closer Look for Kids – Saturdays and Sundays, 10:20–11:30 a.m. Engage in lively discussions and fun activities while looking closely at modern masterpieces and cutting-edge contemporary art. A new theme is introduced each month. There are plenty of free things to do every day in NYC, including some of our most popular attractions. There likely isn’t an inch of NYC you can’t cover on a Free New York City Walking Tour, so feel free to find your guide to Central Park, Lower Manhattan, Greenwich Village, Times Square, Movie and TV locations, Wall Street, Lower East Side, NY Public Library, Grand Central Station…and more! Free Things to Do in New York in Summer – Whether you want free tennis, an outdoor concert, a movie under the stars or free opera outdoors in the park, we have you covered with over 100 FREE things to do in NYC in summer. 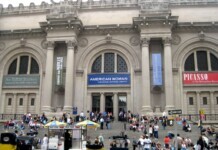 Most New York City Museums are non-profit organizations. Their goal is to make art and culture affordable to everyone. As non-profits, they ask for a “suggested donation” or contribution to access the museum, rather than an admission price. 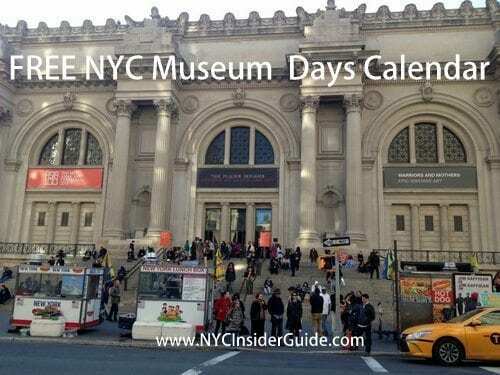 Know the difference and the best times to visit all NYC Museums at NYC Museums and on our NYC Museums and Tours cheat sheet in the NYC Print Guide and free Mini Guide. Don’t miss out on your choice of NYC Hotels with Free Bicycles. If had to pick my FAVORITE way to explore NYC, it would be on bicycle! Just ask anyone who has visited me, I take them all around on bike. The views and hidden nooks of NYC you can see along our greenways are second to none. So why not get yourself a fabulous hotel that offers free bikes to explore our amazing city? 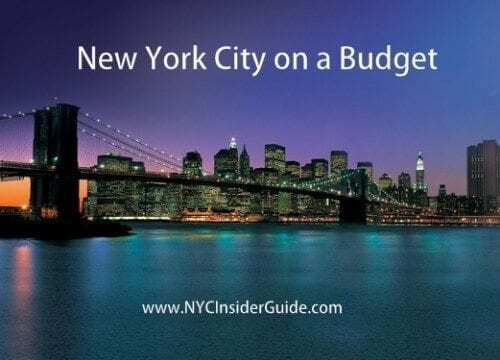 If you are visiting New York on a budget, or even just looking to get the best "bang for your buck," without compromising quality, NYC Insider Guide has 1000s of ways to save BIG in NYC. Here’s a round up of all our top posts on discounts, coupons, cheap, free, half price and many more ways to save on things to do in NYC.